When switching from two-lung to one-lung ventilation (OLV), shunt fraction increases, oxygenation is impaired, and hypoxemia may occur. Hypoxemia during OLV may be predicted from measurements of lung function, distribution of perfusion between the lungs, whether the right or the left lung is ventilated, and whether the operation will be performed in the supine or in the lateral decubitus position. Hypoxemia during OLV may be prevented by applying a ventilation strategy that avoids alveolar collapse while minimally impairing perfusion of the dependent lung. Choice of anesthesia does not influence oxygenation during clinical OLV. 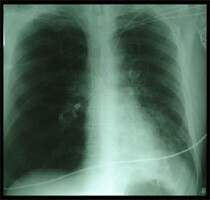 Hypoxemia during OLV may be treated symptomatically by increasing inspired fraction of oxygen, by ventilating, or by using continuous positive airway pressure in the nonventilated lung. Hypoxemia during OLV may be treated causally by correcting the position of the double-lumen tube, clearing the main bronchi of the ventilated lung from secretions, and improving the ventilation strategy. OLV ventilation is required for a number of thoracic procedures, such as lung, esophageal, aortic, or mediastinal surgery. Although OLV is not mandatory for all such procedures, it almost always improves access to the operation field and expedites the process of operation. For this reason and because anesthesiologists’ expertise in placement and monitoring of double-lumen tubes (DLTs) has increased, OLV is now used for almost all thoracic operations in which the lung is operated on or in which the collapse of the lung improves access to the operation field.